Most of the time, I don't give a lot of thought to what I eat for breakfast. But when I have overnight guests or when I want something special I often make this Ham and Egg Pie. A friend was kind enough to give me this recipe more than 25 years ago and it's still a family favorite. It's a savory pie with a beautiful golden brown crust and inside slices of ham are layered with eggs, chopped green onions, grated parmesan cheese and lightly spiced with crushed red pepper, along with salt and pepper. While we love to have it for breakfast, it also makes a nice weekday dinner served with a tossed green salad and fresh bread. This Ham and Egg Pie is a two crusted pie and I use frozen commercially made puff pastry (Pepperidge Farm Frozen Puff Pastry Sheets are readily available and can be found in the freezer section of most grocery stores). The frozen puff pastry does need to be thawed before using. While you can just leave the frozen puff pastry on the counter to thaw (usually takes about 30-45 minutes), I prefer to thaw it overnight in the refrigerator. 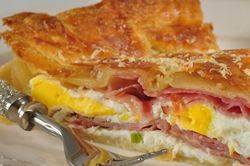 Once you line your pan with a sheet of puff pastry, we then layer the ham with the eggs. I like to cut the ham into bite sized pieces as it makes the pie easier to cut and eat. I add also like to add some green onions, grated parmesan, and crushed red peper flakes for flavor. If you like you can use shallots or minced red onion instead of the green onions. And grated gruyere or another type of flavorful cheese could be used instead of the grated parmesan. The top of the pie is brushed with an egg wash (helps with browning) and extra grated parmesan cheese (for added flavor). Once the pie is baked until golden brown, let it cool for at least ten to 15 minutes before serving. Leftovers can be covered in stored in the refrigerator and simply reheated. Ham and Egg Pie: Preheat oven to 400 degrees F (200 degrees C) and place rack in center of oven. Have ready a 9 inch (23 cm) quiche pan or pie plate (pan). On a lightly floured surface, roll out one sheet of puff pastry to fit your pan. Gently transfer the pastry to your pan. Evenly arrange 1/2 of the ham on top of the pastry. Then sprinkle the ham with the green onions, Parmesan cheese, salt and pepper, and crushed red pepper flakes. Break the 7 eggs and place them evenly on top of the green onions. Gently prick each yolk with a fork but do not stir yolks and whites together. Top with the remaining ham. Roll the second sheet of puff pastry and place over the ham, pinching the two sheets of puff pastry together. Trim off any excess pastry with a sharp knife. If you like, gather up leftover scraps and roll out to make cut outs in various shapes. Place on top of puff pastry crust. Egg Wash: Beat egg with milk and brush the top of the puff pastry. Sprinkle with the Parmesan cheese. Bake in preheated oven for about 30 minutes or until golden brown. Remove from oven and cool on a wire rack for at least 15 minutes. Serve hot, at room temperature, or cold.